We're excited to be one of few bloggers chosen to test out the new SnoozeShade Luxe. I was pretty excited to test it out because until now I was using an IKEA tulle curtain to shield Baby T from bugs, I kid you not! It was left over from our wedding when I used it for decorations, I thought you may want to know that. 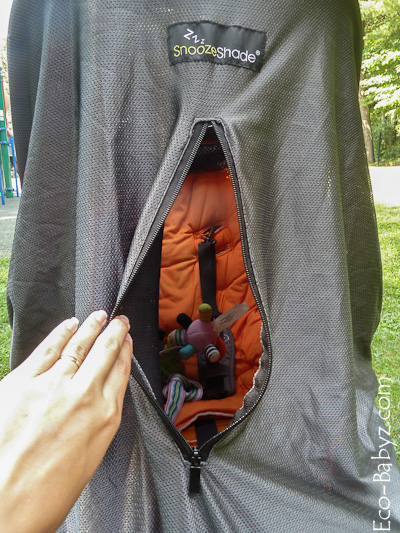 So this is perfect, not only is it ideal for keeping bugs at bay, it shields the baby from the sun and creates a cozy sleeping environment inside the stroller. Excuse the absence of super cute baby inside the stroller, Baby T just hit the I-discovered-crawling-so-I-don't-want-to-be-stuck-in-a-stroller stage. It's brutal, hope he'll get over it soon. The new SnoozeShade Luxe that we tested out isn't even available in stores yet! It will be soon, and meanwhile one of you will win the SnoozeShade Original. Where was this when I really needed it!? When the sun was low during the evening walks and Baby T was just 6 months. When the bugs wanted to eat him alive at a family cookout. When inconsiderate childless folks strangers would come up to look at the cute baby and wake him out of his sleep!? Yes, that's exactly when it's nice to have a SnoozeShade. You probably get the idea that it really is a must-have. 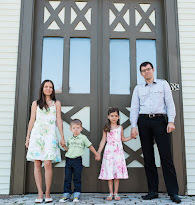 I can go on and on about occasions when this would have been a lifesaver, making parenting so much easier. 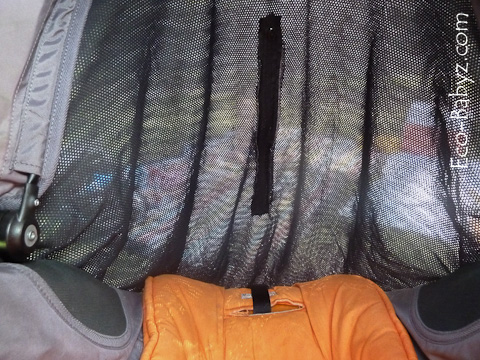 Here is a peek inside the SnoozeShade Luxe on a City Mini stroller. I left one peek-a-boo window on top of the canopy open for the purpose of the photo, so it would be a little darker inside if it was closed. The zipper? Really quiet, so you don't wake your baby if you want to take a peek. This is what your baby will see from the inside, but it will be a lot darker, I had to open the back flap to take this photo, so it made it pretty bright inside. 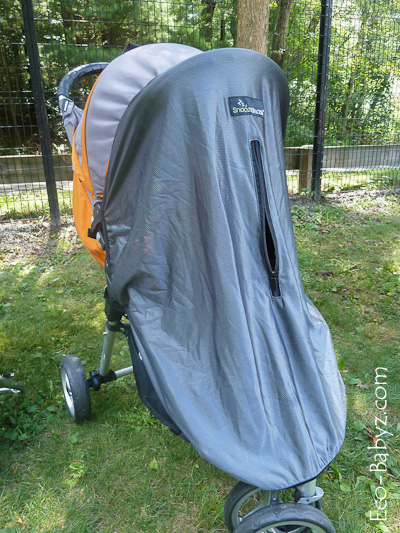 You don't have to remove the entire SnoozeShade when placing baby in or taking him out, you just pull down the front of the stroller shade that goes on top of the stroller canopy. Installing the SnoozeShade took less than two minutes, these installation videos were helpful to see beforehand. It's made to fit any stroller. It does actually keep the inside of the stroller quite cool, even with direct sun. It's even better when there is a breeze, it has great ventilation. I would love to see it made in a light gray color too, something I would prefer. I highly recommend this whether you take walks with your baby, travel, or your baby likes to sleep outdoors in fresh air! Connect with SnoozeShade on Facebook and Twitter! One of you will win the SnoozeShade Original for your little one! I love the snoozeshade for the playard, lots of times that that would be very useful! Love the snoozeshade for playard! I love that it has a zipper on the front & is made out of breathable fabric to let good air flow. I love that it offers great SPF protection (50+), and is easy to install. I like that they also have one for infant car seats! I am loving the SnoozeShade for Play yards. Genius! So could use one of those! I'm in love with the new SnoozeShade for Play Yards! I like the SnoozeShade for Infant Car Seats. I learned you can use the Snoozeshade Original as early as birth with your little one. Snoozeshade give the baby privacy while he/she is sleeping. I like the snoozeshade for cots. Love that it blocks 94% of the light. Babies need their sleep! 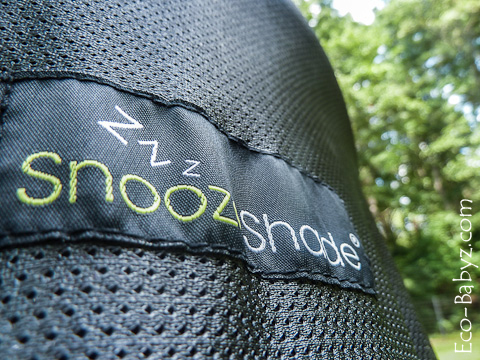 The Snoozeshade for cots is amazing!